South Korea's presidential office says Seoul is discussing plans with Washington for a third inter-Korean summit this year. Chief press secretary Yoon Young-chan revealed the move in a meeting with reporters on Friday. Asked whether the U.S. wants to “strategically” mediate between the two Koreas, given the apparent stall in North Korea-U.S. negotiations on denuclearization, Yoon said it is why the two Koreas should hold a summit. He added that it is also a matter of sovereignty. As for when a declaration will be made to formally end the Korean War, the secretary said it is highly likely to occur after the forthcoming inter-Korean summit. 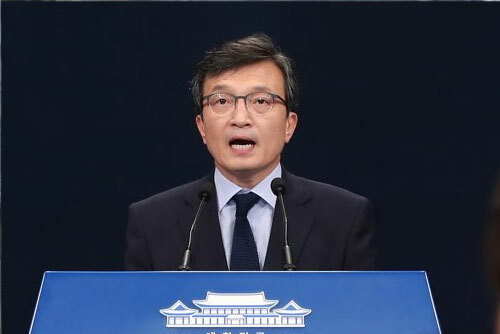 Presidential Spokesperson Kim Eui-kyeom earlier said the war-ending declaration would be discussed during high-level inter-Korean talks scheduled for next Monday.